Your logo is so important to your business, but how often does it need updating? Should it last forever? Maybe you’re considering getting a rebrand but you’re just not sure if it’s the right time. I am going to talk you through some of the situations when you might consider a rebrand. Your business evolves, and so your logo must too. That doesn’t mean that every time you offer a new product or service you must shell out for an entirely new logo! But when you introduce lots of new products that are out of sync with the rest, or you change direction entirely, your branding is often left looking out of place. Take Amazon for example. Their early logo back when they were still ‘earth’s biggest bookstore’ is a horrendous mess completely different design to their now instantly recognisable arrow logo, reflecting the fact they now deliver everything from a to z. Pretty self-explanatory this one. If the name has changed, your logo is obsolete unless the symbol is still relevant somehow. However, you might want to take a step back and ask why the change of name has taken place. 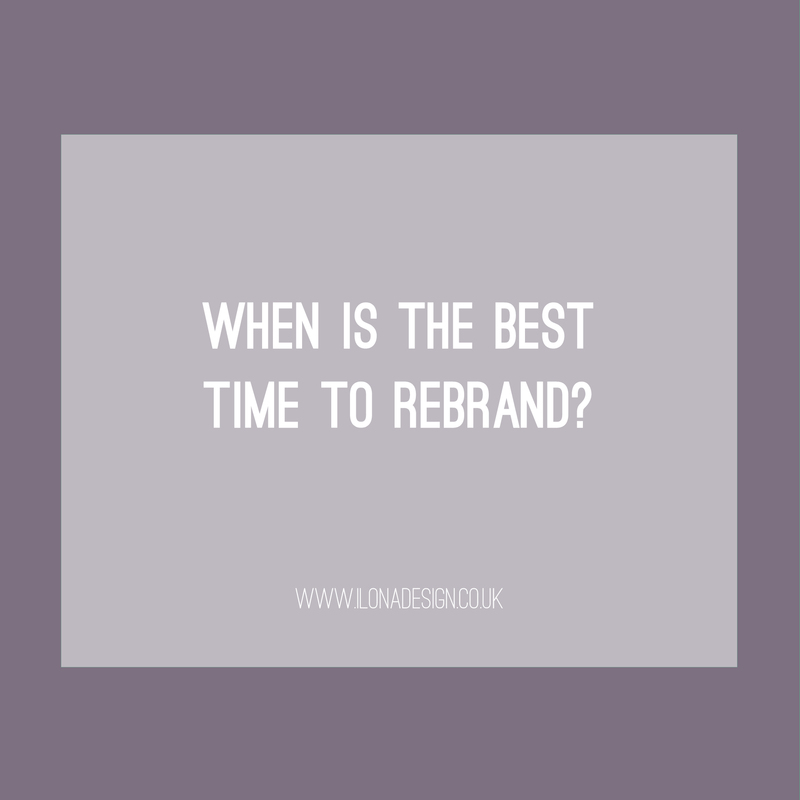 If it is because someone new is in charge and they want to put their stamp on the business, that is not a good enough reason for a rebrand, and might end up annoying both staff and customers. However, if you have made an exciting new collaboration or your previous name was no longer a good fit for your business, then a new logo will be understandably necessary. Logos are designed with not just the business itself in mind. They are designed to attract the right customers or clients to that business. But when this ideal customer changes, or the business is now targeting a different share of the market, a logo that the new audience better resonates with is a sound business investment. Perhaps when you started your business, you were one of very few offering that particular service/product. But now, there are many others just like you, all offering the same or similar, and you want to stand out. It is no longer enough simply to have an appropriate logo; you now need it to prove you are better than the rest. Nobody looks at your branding more often than you do. After a while, you become aware that it has started to look a little old. The process is a balance. While your initial branding, if done to a high standard by a professional, could easily last 10 years or more, it doesn’t mean that logos don’t benefit from evolving along the way. Take for example the Firefox logo. The same fox/world combination remains, but every few years it has been simplified, rounded and colours have been tweaked, to keep it looking fresh while still reflecting the company. Nobody has noticed the changes, and that is the point; it has kept the logo looking fresh before anyone noticed. However, if you have left it a long time, it might be better to go with an entirely new design. Take the new FSB branding for example. It is a complete departure from the logo they have had since inception some 42 years ago. Their previous logo was a professionally designed asset to the association and really stood the test of time. But their new logo reflects the way they are changing with the world of business. It is fresher, younger, friendlier, and goes hand in hand with their new website. It is fair to say many people are critical of change. The fear of peoples’ reaction sometimes causes business owners to stall for too long. They are also afraid of ‘losing’ the customers they have worked so hard to get by launching a brand identity that is suddenly ‘unrecognisable’. The truth is, your biggest fans and most loyal customers will be as excited as you are with the rebrand. Shout about it from the rooftops! What most business owners overlook is that their brand is so much more than their logo. What matters most is that they continue to provide their customers with the same quality that they always have, while adapting to the changing world and needs of their customers. If you think it’s time to rebrand your business and you’re looking for a designer to take on your project, I’d love to discuss your project with you! As of now (January 29th) I’m booking new clients for March 2016 onwards. Check out my services and get in touch if you’d like to schedule a time to talk!